ABA Pays It's Respects To One Of The Best.. 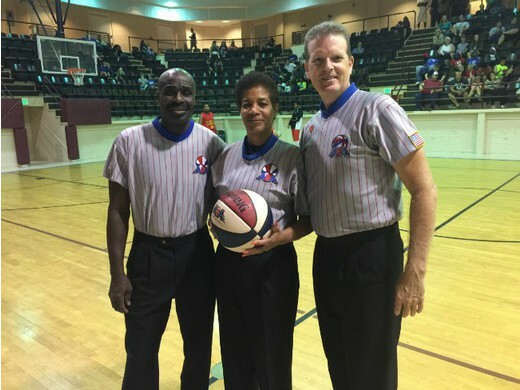 The ABA officiating Family is saddened to hear of the loss of Topeka, Kansas native Rhonda Grayson. Rhonda passed away suddenly on Monday, August 20th, 2018. Rhonda was hired to the ABA Staff of Officials in 2001, just one year after the league was formed. She was the very first female official hired to the ABA Staff. Rhonda served as a highly ranked and respected part of the ABA staff of officials for 17 years and appointed early in her career as a ABA Crew Chief. She worked numerous games throughout the years in the ABA to include many key ABA playoff and championship games. Rhonda was a leader through her examples, her personality and her displays of outstanding talents as an official. Rhonda officiated basketball at all levels, HS, NCAA (approx 20 years as a NCAA Official in the Jayhawks JUCO Conference, Heart of America NAIA, SLIAC—St. Louis Intercollegiate Athletic Conference, MIAA—Mid-America Intercollegiate Athletic Association) and professional with the ABA and USBL. She was the first female official to officiate a boys high school varsity basketball game in Kansas and was very well known and respected within her local communities and associations of HS Basketball, Volleyball and Football. "Rhonda was one official that I can look back upon as her supervisor of all these years and say that I never heard anything negative about her...never, not from players, coaches, team owners, fellow officials. This is almost an impossible feat to accomplish as an official of so many years. This aspect alone to me, speaks volumes of the type and quality individual this woman and I am proud to say, ABA Crew Chief Official was on and off the court. She was the ultimate professional. She will be dearly missed by our ABA Family."